This year my primary care physician got promoted to an administrative position, so I needed to find a new doctor. Unfortunately, I did not choose well, and I will not be going back to this DO for future check-ups. What “Doctor Smith” did and did not do is instructive for all of us. When meeting someone for the first time – whether in your business or personal life – there are simple actions you can take to make a strong, positive first impression. And there are other behaviors that really turn off the other person and make it difficult to get the relationship off the ground. Here are 5 things Doctor Smith did that convinced me I did not want to return. 1. He did not introduce himself. The exam began with the nurse asking me questions about my medical history and entering my responses into their computer system. 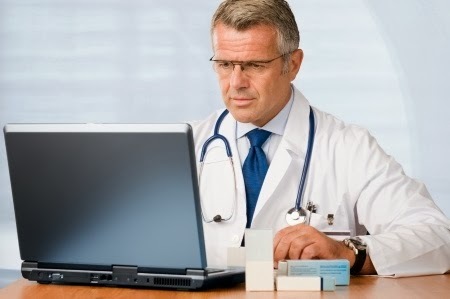 When Doctor Smith entered the room afterwards, the nurse left and he went straight to the computer and started reviewing what was on the screen. He didn’t look at me, say hello, state his name or confirm who I was. I had to assume he was my new doctor. Lesson: It’s so basic! When you first meet someone, a warm handshake accompanied by a friendly greeting help put the person at ease. 2. He never had direct eye contact with me. During the entire time I was there, Dr. Smith looked mostly at the computer screen. A few times he glanced over my way but not once connected with my eyes. He couldn’t have described me to someone if he’d been required to do so. Lesson: When someone is trying to have a conversation with you, have the courtesy to give your full attention and look at them as they’re speaking. While he was looking at my lipid profile, I started to talk about the fact that I was concerned about my HDL number being low and I’d changed my diet in an effort to raise it. Before I could finish my sentence, he jumped in and said that modifying my diet wouldn’t do any good and that my number was just fine. A few other times he cut me off as I was attempting to say something. I finally gave up. Lesson: If people are trying to tell you something – let them finish! Even though you may think you know where they’re going, or you wish they’d get to the point faster, it’s important to let them express their complete thought before you jump in. 4. He did not ask questions. Dr. Smith didn’t attempt to learn anything about me – either personally or professionally. I got the distinct feeling that he was just running through a drill, checking off all the requirements to cover for an initial visit. Lesson: If you really want to connect with someone, ask open-ended questions that reflect a genuine interest in learning more about their interests and their life. Most people prefer to talk about themselves, so you will stand out when you focus on listening more than talking. At one point as Dr. Smith was reviewing my blood work from the previous year (looking at the computer monitor, of course), he commented that it all looked good. I said I was surprised he had that report in his records since I had the blood drawn at a different healthcare system. In fact, I’d brought a hard copy to give him because I’d assumed he wouldn't have access to it. He said I must be wrong about where I had my blood work done, that I must have come to his medical building. I replied that I had never stepped into that building before this day and I clearly recalled where I had gone. He continued to insist I must have forgotten. What I’d hoped would be a positive experience with a new physician turned into a huge disappointment. It served as an important reminder that each time we interact with another human being, we have the opportunity to make that person feel valued…or overlooked. You have that choice every day with every person you encounter. Another great one is to command a patient to do what he just said he was doing already. Love the message you deliver in this post. Genuine caring is rare in many professions. Compassion set us apart in the minds and hearts of clients - very powerful. Joe, yes, that's another example of poor listening. Steve, thank you for your positive feedback. If more businesses realized the impact that caring front-line employees can have on customer loyalty, I have to think they'd do a better job of hiring/training people. Trader Joe's is one of the few companies that "gets" this, in my opinion. Meredith, thank you for another excellent article. Your experience with this doctor is almost exactly the same experience I have recently had with a doctor. Feeling that someone really cares, whether it is in a business setting or medical facility, makes all the difference in the world. And I agree - Trader Joe's is a good example of excellent hiring and training results. Ann, sorry to hear that you had a similar experience. It's a shame that more businesses do not understand what a difference that one caring person can make in a customer's decision to stick with them or go somewhere else. Hey good to know your feeling with 5 things Doctor Smith and also appreciate that someone really cares, whether it is in a business setting or medical facility. Totally this content will be more helpful to us all because it's providing a professional knowledge. The impression I like most when meeting someone for the first time whether in your business or personal life there are simple actions you can take to make a strong, positive first impression. And there are other behaviors that really turn off the other person and make it difficult to get the relationship off the ground. Good to know this concept here and also thankful for this brilliant post.